In July, I was celebrating my first harvest in spite of my being a lazy gardener this year. 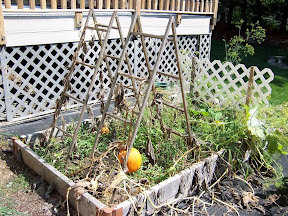 Everything was green and thriving, especially my pumpkins, a 2nd year "experiment". Every day, I was eagerly counting the number of egg- and apple-sized baby pumpkins, anticipating how many pies I'd be making come fall. What happened? Around mid-July the vines looked a bit yellow, so I decided that in my laziness I had neglected to water them enough. So I gave them a good long drink. Then it rained for 2-3 days. I thought the continuing wilting had to be from too much water now, so I left them alone for a while. My biggest pumpkin, #1 kept growing, big and dark green, until it became almost the size of a volleyball. Then it began to show a glimmer of orange speckles, then streaks of orange, and finally a full blown colorwash of orange, and the other pumpkins began to change also. Then I noticed something like mushy sawdust right at its stem . 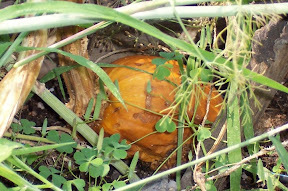 . . and when I got close enough for an inspection, I found wormy creepy-crawlies had invaded my prize pumpkin! I couldn't believe it! I checked all the others, and sure enough, these aliens had taken up residence in each and every pumpkin. The total crop was a complete loss. What could have done this to me overnight? 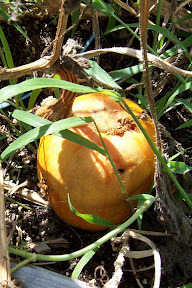 I searched online, hoping to find some secret pumpkin pest that I couldn't possibly have foreseen. By the description of the vine devastation and these "larvae" I think I found the culprit -- the squash vine borer. Upon reading the details of the havoc this insidious creature wreaks, I've come to believe that they are also responsible for the annual demise of my yellow squash and zucchini plants. Every August, the yellow squash appears to succumb to the heat and/or excess water from summer storms -- or so I believed. Now, I think they've been invaded by squash vine borers, and I just didn't know any better. Apparently, I could have treated my plants by spraying them with an insecticide weekly to prevent the adult from laying its eggs successfully. If I had known that moth-like creature would do so much damage, I might not have admired it so much as it flitted around the garden. It looks like my zucchini plants have also been attacked, but they are still producing and growing well -- so maybe they are especially resistent to these bugs. 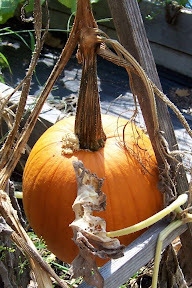 So -- I'm not sure if I'll try pumpkins again next year. They need much more space to grow than I have available. I really like zucchini and yellow squash in the summer, so if I plant them again next year, I'm going to have to be less lazy and find an organic insecticide that will pulverize these pests. I do have several organic products in my garden closet; I'll have to read the tiny print on the labels and find out if they kill squash vine borers in addition to all the other nasties . . . I just want to be sure I don't harm the beneficial insects. The tomatoes, cucumbers and peppers seem to be unaffected, and are continuing to do well. I have enough Big Mama's to make a large pot of tomato sauce and I'll probably need to set aside a day for canning the others soon. I'll call that a garden success for this year!